The Zora Neale Hurston Award acknowledges an anthropologist who has shown mentoring, service and scholarship within historically underserved populations of the South. Established in 2006, the Hurston Award recognizes those SAS members who have made exceptional contributions to anthropology and the public good by exemplifying the skills of the discipline for the benefit of others. This award is presented specifically to a senior scholar for their works in the form of scholarship, applied research, multi-media (book, film, articles), and/or organization and mobilization of people to provide meaningful services to communities. Zora Neale Hurston (1/2/1891-1/28/1960) knew the adversity, pain and challenges that cut across issues of ethnicity, class, and gender. At a time when most African-Americans were denied entry into institutions of higher education and intellectual circles, Hurston's talent and drive gained her access. 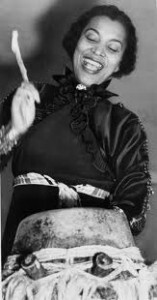 Born and reared in Florida, she studied folklore at Howard University and Barnard College (her institution of matriculation, B.A. 1928). From 1928-1932, she studied anthropology at Columbia University with Franz Boas. Ms. Hurston was a writer and leader in the Harlem Renaissance during the 1920's and 1930's. She was a member of American Folklore Society, American Anthropological Society, American Ethnological Society, and Zeta Phi Beta. She received a Guggenheim Fellowship, 1936 and 1938; Litt.D. from Morgan State College, 1939; Anisfield-Wolf Book Award in Race Relations, 1943; Howard University's Distinguished Alumni Award, 1943; Bethune-Cookman College Award for Education and Human Relations. She wrote seven novels of authentic black experience of her era, including Their Eyes Were Watching God, and fifty articles, short stories and plays. Her work with Alan Lomax on folklore in the south is valued today. Alice Walker claimed Hurston as a "literary ancestor" in the 1970's, and placed a tombstone on her unmarked grave which reads "Zora Neale Hurston, A Genius of the South". This award, in her honor, pays tribute to her many lasting contributions to anthropology and southern studies and is a testament to her enduring spirit, courage, and ability to make ethnographic work and folklore meaningful to the public.